It looks like the bill has passed to name the new Bicycle/Pedestrian Lane that will be added to the Jefferson City Missouri River bridge after Pat Jones. The bill was HB 1941; it passed Thursday, May 13th. The bill now awaits Governor Nixon's signature. Groundbreaking on the new path, which will link Jefferson City with the Katy Trail, was held earlier this week. Pat Jones is widow of Ted Jones, one of the key founders of the Katy Trail, and is herself a key supporter of bicycling, trails, and parks issues in Missouri. 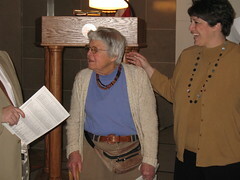 Pat received a special award from MoBikeFed at the 2009 Bicycle Day at the Capitol for her work in support of those issues. 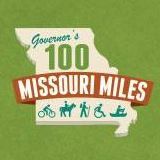 » Next story: Complete Streets Resolution passes Missouri House with one hour to spare!